In the athletic wear world the Under Armour brand has almost become synonymous with training gear. Kind of like how Tupperware can stand in for just about any plastic food container, how Colgate is shorthand for just about any toothpaste (for Pinoys, at least), or any tissue is a Kleenex. It’s a testament to the subliminal skill and power of their marketing push. Their “Earn Your Armour” tagline has certainly inspired many a couch potato to get to the gym, go on a run, or try out that free martial arts class. 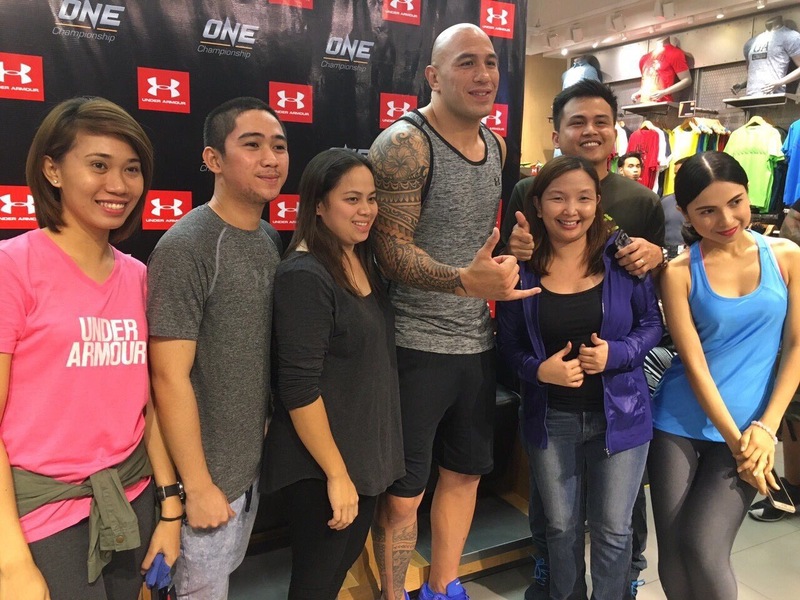 Brandon “The Truth” Vera, proud Fil-Am and ex-UFC title contender and current One Championship heavyweight, recently made an appearance at the local Under Armour flagship store at BGC. 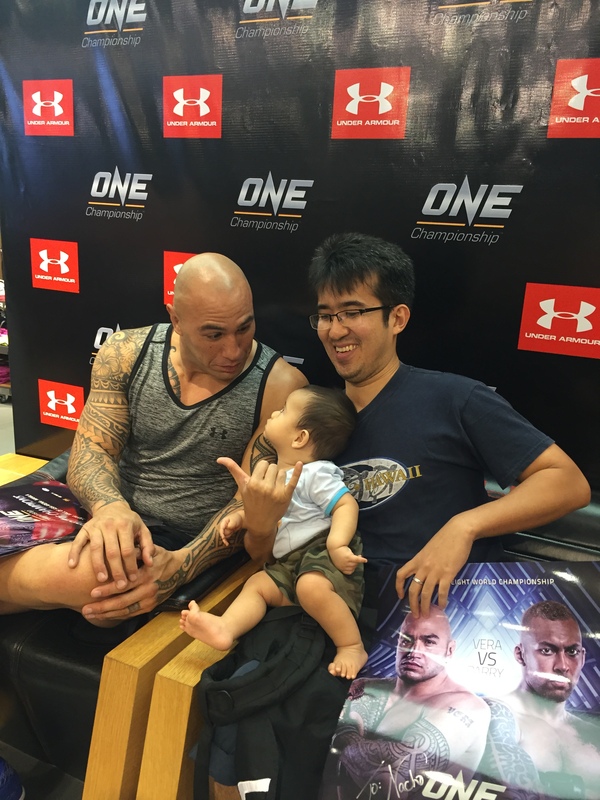 Pinoy MMA fans got the chance to win, as Under Armour gave away tickets at the store last Sunday, December 6. Under Armour South East Asia officially announced their support for international MMA superstar Vera, with fellow Under Armour athlete Mark Streigl. Vera and Stiegl couldn’t have chosen a better brand to support their training, and carry into the cage. Behind all the slick wordplay and hoopla, the quality of Under Armour equipment shines through. Their compression gear, in particular, has been praised by grapplers and MMA fighters both amateur and pro, for its benefits in intense training. Their rash guard and leggings are proven to help with endurance activites (ie running, cycling, etc) and is all about doing everything it can to reduce the amount of movement you feel regardless of the movements you are making. How? The company has created a new material that is able to stretch four ways rather than the usual two, wick sweat away quickly, and ensure it doesn’t smell once you get sweaty. The idea and tech behind compression gear is this: that by wearing a figure hugging top and leggings reduce both room for injury and at the same time offer core support around your muscles — in particular your stomach, sides and lower back; for your bottom, your legs calves and quads. The compression and support lessen the carbon dioxide and lactic acid build up which leads to fatigue, and they also help with proper form, aiding muscle oscillation and keep your body temperature on an even keel. Some athletes swear that they also aid recovery times, too. Back at the Under Armour store at BGC, fans were able to interact with Vera, getting their shirts and rashies signed and just enjoying the positive spirit and aura that a fighter of Vera’s stature brings to a room. Vera is set to fight this Friday, December 11, at ONE: Spirit of Champions against Taiwanese fighter Paul Cheng for the inaugural heavyweight world title. The fight will be held at the SM Mall of Asia Arena.